Alfa Romeo Giulia Veloce | News by Wales Express News, People Before Profit! IF there was one car law I had the power to change it would be to scrap front the number plate and save great looking cars from being defaced. We have binned the road fund licence disc on the windscreen so let’s do the same with this outdated institution. Yes, my argument is as thin as a head gasket and based solely on sentiment. Around this time 20 years ago I was lamenting the need for a number plate on the front of the new Alfa Romeo 156, the most stylish saloon of its day. We did not have much choice then but it still spoilt a thing of beauty. A bit like drawing a moustache on the face of the Mona Lisa! In Italy, the birthplace of Alfa, the number plate is minute compared to ours while the Yanks have embraced 21st century technology and done away with it. Sensible move. My passion for Alfa Romeo stretches back nearly 50 years after a friend gave me a lift in his Alfasud. It was the equivalent of a modern day hot hatch, though not quite as quick, but the way it danced through bends left a lasting memory. I wanted one but a decade would pass before I got behind the wheel of an Alfa again. Thankfully I have driven quite a few in the last 35 years and moaned about a few as well. Dodgy gearboxes, dodgy trim, but you put up with it because it’s an Alfa. 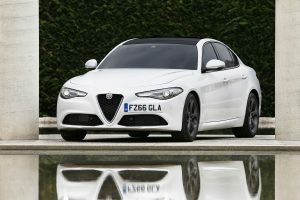 The Italian company has revived the Giulia name for its latest sports and true to form is a masterpiece of car design. But that gorgeous face is spoilt by our incongruous number plate. Alfa has had a few troubles down the decades but here’s hoping Giulia, and the new Stelvio SUV, will help keep the wheels turning, and of course the great name is back in Formula One. Looking like a catwalk model is one thing but can Giulia cut it against the mighty German sports saloons, not to mention our own (well sort of) Jaguar? Giulia has got off to a promising start picking up two awards from the Evo sports car magazine and for the first time in a long time an Alfa sports saloon can take on and beat its rivals. How has it done it? Rear wheel drive. Its front wheel drive predecessors were good but no match for a BMW 3 Series. 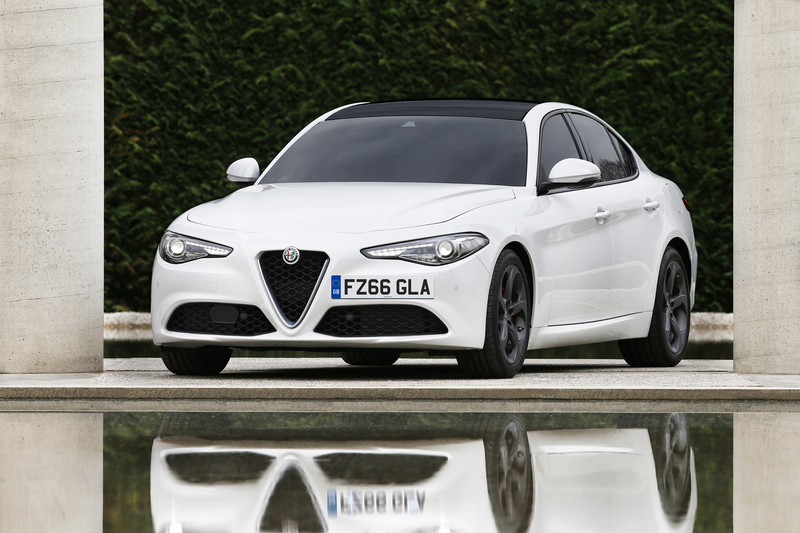 The switch has turned Giulia into a dynamic thoroughbred. The balance is fantastic allowing it to sweep through the twistiest of bends. Quick response steering has always been an Alfa forte and on Giulia it is sensational, and that was before I switched to the dynamic setting which sharpens throttle, steering, brake and engine response. There is a choice of two diesel and three petrol engines and I would make a beeline for the 280bhp petrol turbo that powers the Veloce model. You get an adrenalin rush whenever the fast pedal is floored, helped by well spaced ratios in the eight speed auto box which turns into a manual should you choose to play with the steering wheel mounted gear change paddles. It sounds great as well but then Alfa petrol engines always do. Thankfully I can report no dodgy trim in the Giulia’s cabin. Everything fits and it has a sporty look but it is still to teach the dizzy quality heights of an Audi. And yes there were a few minor niggles. The heated seats took an age to warm, and nearly £40 grand should stretch to a rear view camera and keyless entry. One new feature I particularly liked: The starter button on the steering wheel. Ace! So Alfa is back in the mix with a sports saloon that is red hot. A week really wasn’t long enough for me in this beauty.